I felt moved to blog about the importance of healthy, positive thinking today. I, like many I know, struggle with the ability to always walk on the sunny side of the street (and this is only in metaphorical terms, because I will go out of my way in my daily walk to and from work to stay on the side of the street where the sun shines). Negative thoughts are a slippery slope, the more you feed them, the more they begin to consume your mind. It’s like when Mike’s family started giving Charlie table food, now it’s all he wants. Charlie only has eyes for food that isn’t his. He has no room or desire to fill his body with what is good for him. He only wants to consumes the bad stuff. 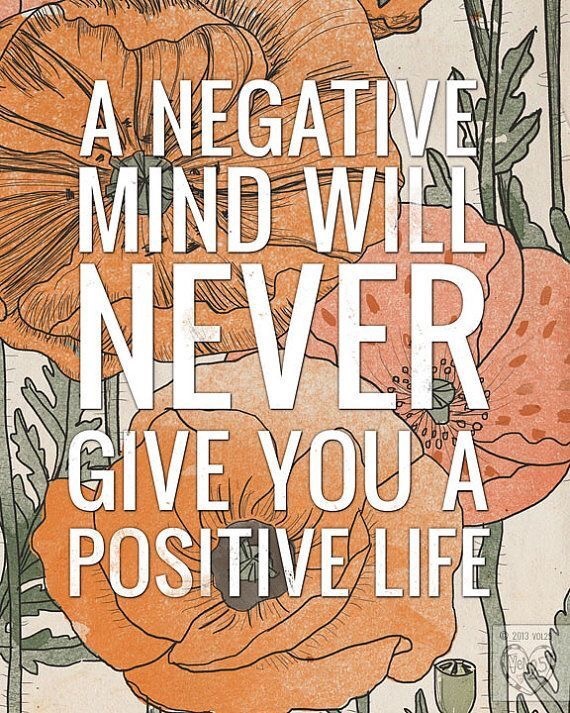 Negative thinking is the same and unfortunately it’s highly addictive. Luckily, I have found the key to staying positive and to maintaining a healthy mind no matter what I’m emotionally battling. In order to think positive and have a healthy outlook on life one must be first truly happy with themselves. Being not only comfortable with yourself but confident in yourself. This spans across both physical appearance and being fulfilled with work or life outside of work. As I touched on in an earlier post, it’s one reason why I revived my blog. Though I like my career well enough, it doesn’t fulfill me or challenge me creatively, which at my core is what makes me truly happy. I would venture to say that being content with one’s physical appearance, unfortunately, is more important. It would be nice if this wasn’t the case, but society, which we can’t separate from, puts increasing pressure on us to look and feel our best, but we must remember, this is what God wants for us too. Our bodies are a temple, a gift if you will, that should be cherished and maintained for optimum performance. Now I don’t want you to think that I’m saying everyone should look like Greek gods. Everyone has a different place that makes them feel their best. Just because for me this means working my booty off in the gym 5 plus days a week and eating paleo does not mean that’s what I recommend for everyone. Working out does the following for me: releases endorphins, provides me with time to de-stress from my day, gives me something to focus on other than work, gives me goals, makes me feel strong and empowered, keeps my mind body and soul healthy, but most importantly, continues me on the path of feeling confident in my own skin which filters in to every other task I set my mind to. Going to the gym keeps me positive, happy and fit. Just today when I left the office at 7pm to head to the gym, my two male coworkers mentioned how they have no idea how I do it. I replied that it’s what keeps me going. Especially in the winter, I need the gym more than ever. Having this as my backbone sets a good foundation for other healthy positive thoughts and energy to flow. I do get down and out, and when I feel particularly negative and moody, I ALWAYS feel better after the gym. I encourage you to find your backbone, in whatever it is that makes you feel good about you and who you are. Confidence is key to healthy thoughts and a healthy mind. Once this is in place, it’s much easier to ward off the negativity when you feel it creeping in. The more positivity you fill your life with, the less room there is for anything that isn’t just that. Thursday is my favorite day of the week, which inspired me to share my happiness with my readers going in to the weekend. Stay strong, stay healthy, stay happy! Partially blogged while waiting for Mike in the Equinox lobby and partially over a bowl of Miso soup.